It’s free and it’s easy. RPC Creator software enables you to create custom RPC Content. Two versions are available, RPC Creator and RPC Creator Pro. 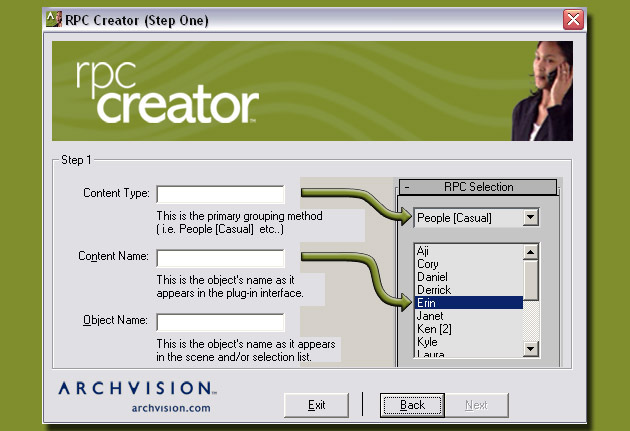 The free version, RPC Creator, can be downloaded and authorized via the following link http://www.archvision.com/products/plugin#rpc-creator-pro. RPC Creator enables you to create 2D RPC objects that always face the camera. Users who desire greater flexibility with their RPCs opt for RPC Creator Pro ($399.00) which is able to create 2D, 2.5D, 3D and 3.5D RPCs. Want to try it out? All you need is an RGB (red,blue,green) and Alpha image (opacity map). If you don’t have one handy, I’ve got one you can have below featuring one of favorite activities. Simply right click to save these to your computer.